Yugoslav tanks rolled into Slovenia on 27 June 1991, just two days after the region had declared independence. It was the first republic to break away from the Communist state created by Marshal Josip Tito in 1945, and which held together for 10 years after the dictator's death. He had formed the federation in an attempt to keep a lid on nationalist aspirations in its six constituent republics, but Slovenia's declaration signalled the end of a united Yugoslavia. The ethnic tensions erupted quickly into a series of bitter and bloody conflicts which lasted for almost five years. I was just a kid, 12 years old. My dad was at the time a policeman and when the tanks started to roll out of bases around the country he was soon called to service. He once called home to be prepared, and said that Special Forces from Serbia were rolling in as Cetniks too. As a police officer he knew much more as any other citizen. Even if this war lasted just ten days it was so short because of the police and not the army of Slovenia. The former army of Slovenia had almost no equipment to fight against the Yugoslavian army. One said here, the war was over because of the good will of the generals and Serbs. Come on guys give me a break. It was won because of the clever thinking of police and officials of that time. I am proud to be a citizen of this small country and if the whole thing happened again, I would gladly defend my country like my father did or our fathers' fathers did. I feel sorry for all the people who died in the wars of Yugoslavia. They could be prevented, but not by the EU or any other country, but by themselves. Instead of helping Slovenia they cheered. If one helped another the war would be over sooner. But as we all knew everyone had to fight its own war for independence. Unlike Slovenia, which only wanted freedom, everyone else wanted land. The country never existed as a cohesive and united entity that many of us would like to believe. The union was full of flaws and its failure was inevitable. Tito's backward thinking and oppression the Serbian people, while promoting other insignificant minorities, eventually led to the break-up of Yugoslavia. I remember I was at school at the time. I had always kept a close eye on the developments of the break up of Yugoslavia, discussing it on many occasions with a close teacher of mine, who like me, had family from this troubled land. We both could see how Yugoslavia was disintegrating and the bloodshed that lay ahead. With family and friends in nearly all of the six republics it was also a confusing time for me. A time when the chaotic and complicated politics of the Balkans once again raised its ugly head. My family in Slovenia were lucky to avoid the destruction that followed in Croatia, Bosnia, Serbia and also Macedonia. Ten years later we see that, apart from Slovenia, no country has gained very much from this war. Bosnia, Serbia and the rest are some of the poorest economic nations in Europe. Many young people left or had to leave their own countries to live elsewhere. Friends, families were divided and split and life was never to be the same again. All states are now independent from Yugoslavia but all look to join an even larger, diverse and more complicated union of nations/states, in the European Union. Ironic it may be, but many things can be taken as to the reasons why Yugoslavia broke up and why it led to bloodshed. The destruction caused by the war will take years to heal, but many countries are heading in the right direction to moving on. As a Slovenian, we welcomed the end of communist Yugoslavia in 1991. Tito's Yugoslavia was doomed, because a disproportionate amount of the budget went to supporting the JNA, its officer corp, which was dominated by Serbs. Billions of dollars was stolen by the Serb-dominated government prior to the war breaking out. 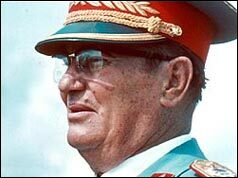 How many people were jailed, tortured, killed or exiled by Tito's "socialist paradise"! The world was fooled by clever communist propaganda. Yugoslavia could never be saved. Slovenians the world over, are proud that they rid themselves of the scourge of the SFRJ. My only regret is that the country still has not purged its civil service, military, and political establishment of the old UDBA! For the first time in a thousand years, we are free to chose our own government. Sadly, the EU fares no better on imposing its so-called values on an independent and sovereign country. It was sad to see so many innocent victims of the later wars in Croatia, BiH and Kosovo. Yugoslavia should NEVER have been created after World War II and the Allies share a big responsibility for the creation of the war criminal Tito and the communist system that repressed it citizens from 1945-1991. The biggest joy was to see the last soldier of occupation(JNA) leave Slovenia in October 1991. I remember the two-week war in Slovenia. I was visiting my family members in Croatia. Shortly after the short war in Slovenia, a Serbian General broadcast an announcement that all separatist efforts will be crushed. That summer people had no clue what events would transpire in the next four or five years. Nobody imagined the extent of the genocide that would occur. I left that summer and only returned four years later after the war ended. If only the world cared enough in the beginning, some people's lives could have been saved. I was on a business trip to Sweden when I heard the news that the Yugoslav People's Army entered Slovenia. I felt as if someone very dear to me died. I worked in the Army at the time and new that it was going to be an unjust conflict because the hard-core nationalists could not be beaten by people (officers) who were trained to protect people and not shoot at them. It is because of the goodness (and one may say naivety) of the generals and not because of the bravery of Slovenians that the "war" finished quickly and with only few casualties. Europe should have done everything to prevent break-up of Yugoslavia - and it did nothing. The main objective was to bring communism on its knees which resulted in a blind support to anyone who claimed to fight the leftist "regime" in Belgrade. It hurts so much when I think how little was needed to prevent this terrible war. Too-early recognition of former republics was an opportunistic and simple-minded move that cost so many lives. All noble people from the former Yugoslavia would not mind living together even today and they were not the ones who supported secessionist ideas, revenge, inflammatory rhetoric, and later fighting and atrocities. For smart and hardworking people, Yugoslavia made much sense both practically and emotionally because the former Yugoslavia was not "a communist country somewhere in Eastern Europe". It was a beautiful country with crystal-clear sea, fertile plains, and majestic mountains. These events marked the beginning of the end of Yugoslavia. The Yugoslav army was plagued with desertions, Croatian and Slovenian officials (including the quoted general) deserted... and the "robust army" as it was called, numbered only 2,000 teen recruits that were easily surrounded by the forces of Slovenian police. It showed that the country was rotten and doomed for disintegration. However, media claims of aggression of federal forces against a country which was not internationally recognized (which is ridiculous in its bases), the claims that are even today present as BBC reports in the headlines, marked only the beginning of the fierce media campaign of "satanisation" of one side (Serbian). That later justified and encouraged the biggest ethnic cleansing of the war (that of the Serbs from Croatia) as well as the military action in Kosovo which came as a cumulative effect. The saddest part is that almost 15 years later, the media refuses to recognise its bias. Now the situation is finished, Yugoslavia has disintegrated and Nato forces have taken position in each part of the country... I think it is the time for the truth to come out, and propaganda to settle down. The war has finished. I remember the day. I was a teenager and lived in Belgrade (Serbia). I live in Sydney (Australia) today as a result of the war. I remember the day as a shock. Federal Army of Yugoslavia was defeated. Tanks were burning, soldiers were wounded, and helicopters were shot down. The day was beginning of the end of Yugoslavia. The rest is a history. As a European I am ashamed when I see what today's EU, then called EC did with Yugoslavia. If EC wanted to save Yugoslavia it could do it easily, but for the egoistic reasons they did not. We see today how much energy and money EU gives to save only Bosnia, and only small fraction of that was enough to save Yugoslavia, which was in every sense much more natural than Bosnia. EU started whole process of enlargement with the destruction of that country, which was in almost every sense representation of all ideals of European Union, multi-ethnic, multi-cultural, etc. Because of that I believe EU has no future, and will end up similarly like Yugoslavia, not maybe so violently, but still ugly. You cannot make bright future on someone's misery. I was a student in Sarajevo at the time. We all watched "the war in Slovenia" in disbelief and thought "Something like this would never happen in our Bosnia." I was about 16 years old at the time and I remember seeing everything as a kind of a movie unfolding in front of our eyes waiting for Sylvester Stallone to appear somewhere in the middle and finding it interesting that Slovenia is mentioned on the CNN news station. Those were confusing times for many of us. When I look back today I try to put a humorous twist to it, joking about how we slept through an air raid only to wake up when it was all over and how a friend of mine did not hear tanks passing near his house on the first day of the war because he was so sound asleep. We had no idea what was yet to come on the territories of the former Yugoslavia. Even today I have a kind of surreal feeling about all of it.